It has not been very long since I visited the land of the Indigenous peoples. I wanted to write this short reflection to contemplate my trip to Canada. I acknowledge that it took me a very long time to write this. That was for two reasons. First, I come from a place where we have suffered from different conflicts, not just over decades but over centuries. I thought it would not be a good idea for me to write a judgment of Canadian society when we are deeply impacted by war in our own region. Second, North American history is very complicated for me even though some have told me it is very simple: the settlers came and destroyed the life of the Indigenous peoples - the story is as simple as that. Even after my first visit to Grassy Narrows, an indigenous reserve, I was not courageous enough to write this reflection. But I made a pledge to my indigenous friends that I would write about their struggle even though I am not Canadian. My journey in Canada began when I arrived in Nelson in British Colombia to finish my course at Selkirk College in mid April. From the moment of my arrival I felt the generosity of the people of Nelson. They were very kind and welcoming. I sensed that life was perfect. Nelson portrayed a perfect Canada in my mind. However, I began to hear from my very good friends, classmates and instructors about some problems and difficulties that Canadians faced. I met many people in Nelson who told me stories about the Indigenous peoples struggle. They gave me an overview of the history and the challenges of indigenous peoples in North America. One late afternoon, I even saw one of my classmates arguing with the police from Nelson about the history of colonization. Or my instructor who expressed concern about the extinction of some indigenous communities in Nelson. I then headed to the city of Winnipeg to join a CPT delegation to Grassy Narrows. People spoke keenly about the indigenous peoples’ cause. Many mentioned to me that their ancestors came and occupied their territories and they had built residential schools where they brought indigenous children to civilize them. Furthermore, they told me that thousands of indigenous women have gone missing and have been murdered in that area. If I could be honest with my settler friends I could not relate to what you were telling me. I could not understand what you were talking about, not because I did not believe what you were saying, but because of your lifestyle. Your lifestyle portrays a perfect society and Canada in my mind. The majority of settlers have good shelter, food and jobs. You feel very secure in your homes and the areas that you are dwelling in. You were all planning for your next holidays. It is not that I believe that this is inherently bad. In my opinion everyone deserves a decent life where you have access to shelter, food, jobs and a good education. But it did not make sense to me when you were saying, ‘‘we are working on settler and indigenous people’s relations”, while at the same time the majority of settlers have access to the best of everything and the indigenous people have access to almost nothing. Of course this is not the only issue because there are so many other things that have to change in order to create a better relationship. I do not want you think that I am making a generalization. However, I felt that the majority of the people I observed with were very comfortable with the way Canada is and their way of life. But I also met many settler friends who were working very hard to make a difference. I got the impression, the will to work for better relations with Indigenous peoples came from individualistic or random persons rather than from collective desire or the Canadian society as a whole. The CPT delegation had just started and I felt as though there was a great deal happening that was not being communicated to me by the settlers that I was speaking to. I felt I had a responsibility to learn about Indigenous Peoples lives and history from Indigenous People, as I myself came from a misunderstood nation where my people have been oppressed for centuries. We started our delegation by going to an event where Winona Laduke, an indigenous Anishnabeg activist was speaking. This would be my first encounter with indigenous peoples . When I entered, I saw a number of curious indigenous youth who were expressing their sorrow about what happened to their parents, grandparents and great grandparents, as well as what is happening to them and their communities. Many sad poems, reflections and articles were shared which profoundly made me question and reflect on their relationship with settlers. I had never imagined that stories like this could have happened or are currently happening in the so called beautiful and democratic country of Canada. One of my delegation co-leaders kept telling me, "Rezhiar this is very important for you". She said "I would be truly happy to hear your opinion about this because I think there are similarities between Kurds and Indigenous people. The way that Kurds and Indigenous people are colonized and persecuted looks very similar to me". She was right; I could see many similarities. The structural violence, residential schools and colonization of Indigenous people left a black scar on the sky of Canada. The medicine people had been replaced by the nursing system, the spiritual traditions by organized christianity, the hunting and gathering traditions were taken over by the welfare system and harmed by environmental damage, the elders were replaced by residential schools, the laws by Royal Canadian Mounted Police (RCMP) and the justice system, and the clan system was replaced by chiefs and councils. When I walked out the sky did not seem blue to me anymore. The next day in Kenora, while learning about the lives of Indigenous peoples, we heard there had been a suicide attempt in Grassy Narrows. We were not sure if we could still go to Grassy Narrows. But after talking to Judy Dasilva, one of the indigenous activists from there, she said, "it is crucial to have CPT and the delegation come visit at this time". We arrived late in the afternoon and people had just started the sacred fire and sharing circle. They were so welcoming and so passionate to share their history and stories with us. I learnt about the problems that indigenous people face across Canada, such as suicide attempts and drugs and alcohol addiction. These things are happening because of the disruption caused by the settlers. In some reserves a gallon of milk can cost up to 40 dollars but in the settler populated areas, it can be bought for only 5. I heard countless injustices from Indigenous peoples whose lives have been deeply impacted, accounts of injustice you would never hear from the mainstream media or other people. I could write many more stories from Grassy Narrows, but I’d rather encourage my settler friends to go and listen to the stories of people there, that they may have the same eye opening experiences I had. The delegation ended and we traveled to Toronto for the River Run festival where Grassy Narrows Youth gathered to urge the local government to clean their poisoned river. The event taught me that despite the black scar in the sky, indigenous youth and peoples all over Canada are very powerful and strong. The youth showed their willingness and hard work to establish a new relationship with settlers. River Run gave me hope. My despair though, was the lack of collective will and hard work from settlers to re-establish their relationship with the Indigenous peoples. 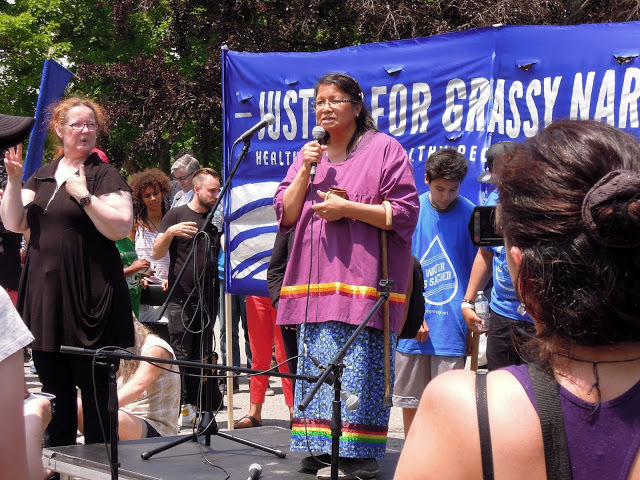 I guess, Judy Dasilva from Grassy Narrows says it best, "It is time to act rather than talk forever". If settlers want a happy and positive outcome, or progress in their relationship with Indigenous peoples, they should all put down their coffee, leave their comfortable homes and walk towards Indigenous reserves to listen, to learn and understand in order to re-establish a better, fairer, stronger, ecological and a more just relationship with Indigenous peoples and their land.